Payments to KES Just Got Easier! We are excited to announce that credit card payments are changing at KES. We have partnered with Plastiq, an online payment provider, to allow you to use your existing credit card to make payments more conveniently through their secure online system. By partnering with Plastiq, we can offer you the option to make payments for tuition and other items by using your MasterCard, AMEX or Visa card. Plastiq will be charging you a convenience fee. Click on the Plastiq PAY NOW button below and you will be linked directly to the KES Plastiq payment site. You will receive a confirmation email detailing the transaction, and all charges will be clearly indicated on your credit card statement. Payments made with this method can take 5-7 business days to be processed to your account, so please ensure that a sufficient amount of bank processing time has been allowed for to meet the due date deadline. Q. Why am I being charged a fee? Plastiq provides their payment platform to simplify the payment process, while providing a convenient and flexible option for parents. The fee that is assessed is one that is typically paid by the merchant for accepting credit cards, and covers the costs of processing credit card transactions. Q. Why should I pay with Plastiq? Making payments through Plastiq is as simple as any other online transaction you have made with a credit card. You can use any major credit card, and there is no registration required to use the service. For more information about making payments through Plastiq, visit plastiq.com. Plastiq is an online payment platform that provides a convenient and secure way to make payments with your credit cards. Q. Will paying with a credit card cost me more? Plastiq assesses a nominal fee for the service — a percentage of the total amount of the payment. Examples of the fee for each card is: MasterCard 1.99%, Visa 1.99%. For each transaction, two charges will appear on your credit card statement: 1) the principal amount of the payment, and 2) the fee. Q. If I make a payment online with my credit card through Plastiq, how long does it take for the payment to go through? Normal credit card processing times apply. Payments are approved instantly, and funding may take from 1-3 business days. Contact a Plastiq payment specialist if you have questions. Go to plastiq.com for more information. Q. Can I still pay in person? Yes. We are simply adding a new option that allows you to make payments with a credit card. 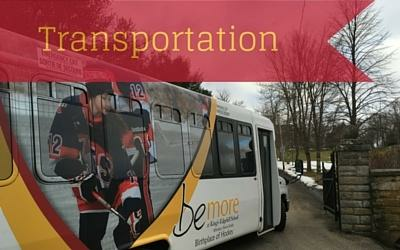 Getting to and from King's-Edgehill School has never been easier thanks to efficient transportation options. We now offer daily bus and shuttle services throughout the Annapolis Valley, to Chester and Metro Halifax. Get in touch with us to find out more. Unexpected bank fees can result in a short balance on your account when payment reaches your institution. Flywire ensures your tuition is delivered in full every time. Avoid unnecessary bank fees and receive favorable foreign exchange rates. Track your payment online 24x7 and receive email and text alerts each step of the way. Enjoy multilingual customer support via phone, chat, and email. * Please note: Flywire is only for use with international transactions. * Please note: The acceptance of local currency is subject to international banking restrictions and regulations.